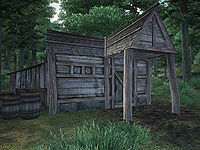 Melus Petilius' House is a small house in the woods north of Skingrad (quest-related). Melus lives here alone. A food cupboard sits beside the front door on the east wall, and a single bed sits in the northeast corner. A clutter sack is on the floor at the foot, with two grain sacks on the north wall. A chest of drawers in the northwest corner contains clothing, and two more clutter sacks sit on the other side of the fireplace. A chest holds clutter beside a bookshelf that holds another clutter sack. The table on the south wall holds three heads of lettuce, a tomato, and a piece of venison. Two pumpkins sit on the floor next to the table. The sacks are the only containers in the house that do not respawn. Molag Bal: Goad the local do-gooder into killing you. Esta página foi modificada pela última vez à(s) 18h31min de 4 de agosto de 2014.